The pluot is a cross between a plum and an apricot. You might also find the fruit labeled plumcot, aprium, or apriplum. 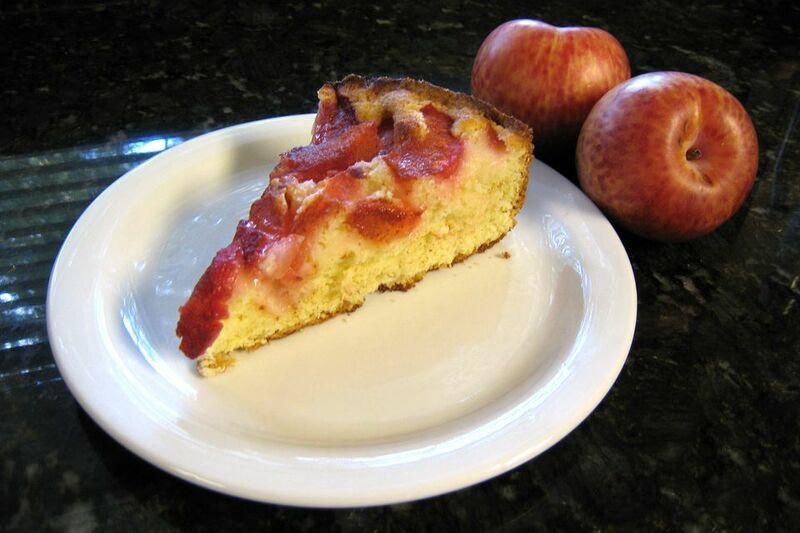 This pluot cake is a great way to enjoy the fruit, either as a dessert or as a coffee cake. The streusel topping is optional, but it adds a nice crunchy texture to the cake. Grease and flour a 9-inch springform pan or spray with baking spray with flour. Slice peeled pluots or plums thinly and toss them in a bowl with 1/4 cup of the granulated sugar; set aside. In a large mixing bowl with an electric mixer, beat the 3/4 cup of butter and 1 cup of the granulated sugar until light and fluffy. Beat in eggs, one at a time, beating well after each addition. Beat in the vanilla. In a separate bowl, combine the 1 3/4 cups of flour, baking powder, and salt. Slowly blend the dry ingredients into the first mixture until the batter is smooth. The batter will be thick. Spread the batter in the prepared baking pan. Arrange the sliced pluots or plums all around in a concentric circle, overlapping slightly. Fill in gaps and overlap with any leftover slices of fruit. Sprinkle the sugar and cinnamon mixture evenly over the fruit. If desired, top with the streusel topping, if using (see below). Bake the cake for about 1 hour and 10 minutes to 1 hour and 20 minutes, or until a toothpick or cake tester inserted near the center of the cake comes out clean. In a bowl, combine the 1/2 cup of brown sugar, 3/4 cup of flour, 1/2 teaspoon of cinnamon, 1/4 teaspoon of nutmeg, and 5 tablespoons of melted butter. Mix with fingers or a fork until crumbly. Sprinkle over the fruit topping.